Order Out Of Chaos blows wide open the official story behind a multitude of both historical and modern day events. Paul Joseph Watson uses mainstream media reports to exhaustively document how governments are exploiting and even carrying out terrorist attacks to further their unified political agenda. Every referenced article is available online so you can cross-check the facts for yourself! Watson goes back in history to show how the same tactics used to centralize power and coerce societies are still being used today. A high-tech prison grid police state is being erected that will envelop everyone on planet earth in a spider web of brutal tyranny. No longer is the New World Order a shadowy enemy lurking on the horizon, it is in our faces and the proof is everywhere. The dark empire of world government is in the final stages of its construction. This book is one of many keys you will need to unlock the door and shine the burning light of freedom upon the twisted souls of the Globalists. 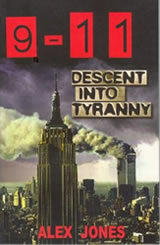 Descent into Tyranny is a brutal exposé documenting the New World Order crime syndicate's involvement in the September 11th attacks. 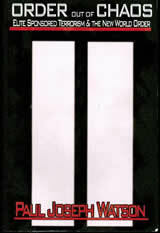 The book reveals how the controlled press is spinning and whitewashing the 911 story. For 170 years they have met in secret. 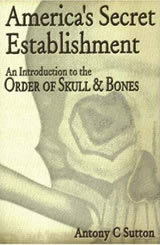 From out of their initiates come presidents, senators, judges, cabinet secretaries, and plenty of spooks. They are the titans of finance and industry and have now installed a third member as United States President George W. Bush. This intriguing behind-the-scenes look documents Yale's secretive society, the Order of the Skull and Bones, and its prominent members, numbering among them Tafts, Rockefellers, Pillsburys, and Bushes. Far from being a campus fraternity, the society is more concerned with the success of its members in the post-collegiate world. Included are a verified membership list, rare reprints of original Order materials revealing the interlocking power centers dominated by Bonesmen, and a peek inside the Tomb, their 140-year-old private clubhouse. 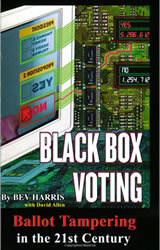 What she learned was that modern-day voting systems are run by private for-profit corporations, rely on a few cronies for oversight, using a certification system so fundamentally flawed that it allows machines to miscount and lose votes, with hidden back doors that enable "end runs" around the voting system. Find out why your vote might not count -- and what to do about it!